Legendary's MonsterVerse is moving along quite nicely so far. The whole thing kicked off in 2014 with Gareth Edwards' Godzilla and continued this year with Jordan Vogt-Roberts' Kong: Skull Island. The MonsterVerse will press on in 2019 with the long-awaited Godzilla 2, and several new monsters are making their way to the big screen. King Ghidorah is set to feature in the sequel and, thanks to a newly released video, the King's arrival has been teased. The Kong: Skill Island Twitter has been releasing little videos and other promotional material in anticipation of the upcoming Blu-ray release. Their latest video gives a little timeline of monster discoveries made by the Monarch Corporation, which is the company that has been tracking these monsters and will serve as connective tissue between the MonsterVerse movies. In the video, it is revealed that Monarch discovered a new superspecies with three heads under the Antarctic Ice in 2016. Godzilla fans know that only means one thing; King Ghidorah. "When Monarch discover an extraordinary superspecies sealed beneath the antarctic ice sheet, Dr. Vivienne Graham leads the effort to build a covert containment and research facility around the dormant creature. Her classified field notes contain a mysterious footnote: 'The Devil has three heads.'" The video helps lay out some of the MonsterVerse continuity. 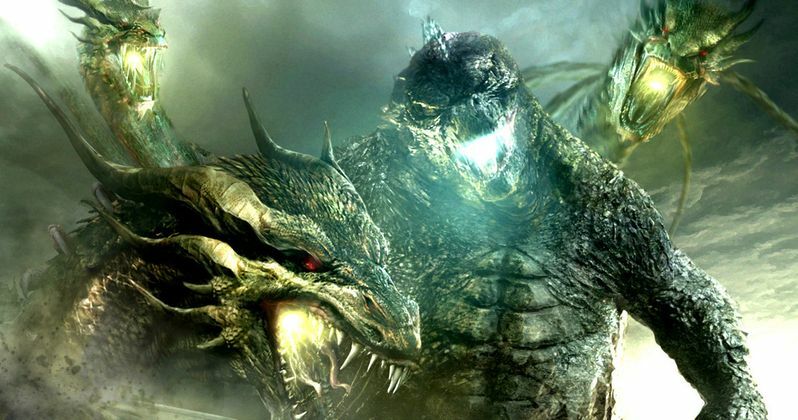 Aside from revealing that King Ghidorah was discovered in 2016, it was also teased that Mothra, who is also going to appear in Godzilla 2, was discovered in 2009. Rodan is also set to appear in the Godzilla sequel, which is being directed by Michael Dougherty (Krampus), as teased by the post-credits scene from Kong: Skull Island. The video also interestingly teases a return expedition by Monarch to Skull Island in 1995. Could this be laying the groundwork for a Kong: Skull Island sequel? Cinematic universes, outside of the Marvel Cinematic Universe, have had issues getting started. Just look what happened with The Mummy this summer. But the MonsterVerse is looking pretty good so far. Godzilla currently has a 74 percent on Rotten Tomatoes and grossed $529 million worldwide. Kong: Skull Island did a little better in both respects, earning a 76 percent on Rotten Tomatoes and nabbing $566 million worldwide. Outside of who reigns supreme at the box office, this will be settled in Godzilla Vs. Kong in 2020, which is set to be directed by Adam Wingard (Blair Witch). As far as Godzilla 2 goes, which was going under the title Godzilla: King of Monsters but appears to have possibly ditched that title, the cast includes Vera Farmiga, Kyle Chandler, Millie Bobby Brown, Charles Dance, Thomas Middleditch, Zhang Ziyi and Bradley Whitford. Beyond that, we know that it comes out on March 22, 2019, and that it is going to feature four legendary monsters duking it out. Godzilla 2 has already started shooting. Sadly, this video doesn't give us any footage of King Ghidorah, but it does help build out the universe a bit. Be sure to check out the video for yourself below.